Economic outlook: Risk of a hard landing? Previous elections were typically followed by positive market reactions as the charts below show, marking the end of election uncertainty, although we also note that macro conditions have generally been favourable around election times as reflected by JP EMBI Global spreads. The June 2015 general elections were the exception in that they produced a hung parliament which then led to snap polls in November when the market backdrop had turned less constructive. 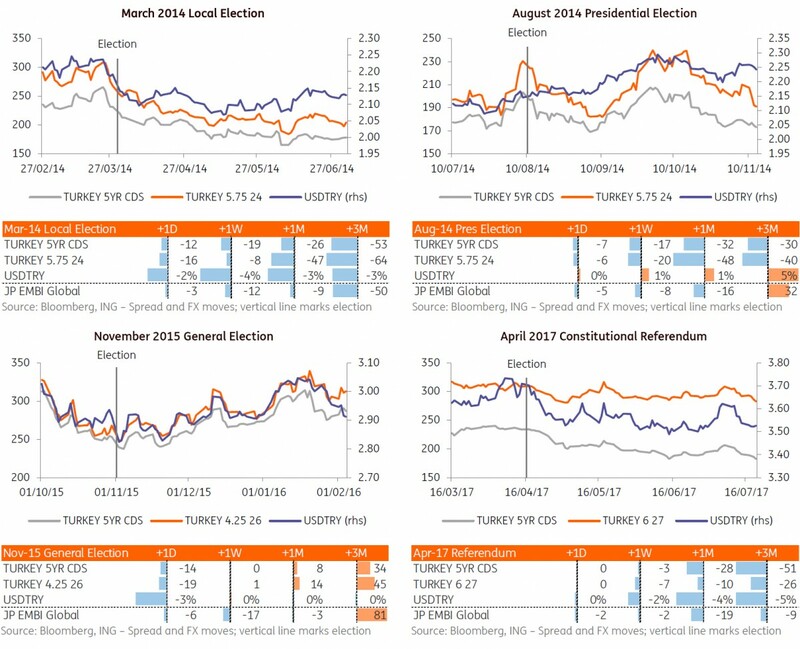 In contrast, market reaction after this year's summer elections has been comparably weak with the lira merely 1% stronger, and Turkey’s sovereign credit spreads wider (+6bp in 5yr CDS and +20bp in 10yr cash) despite the clear outcome in favour of incumbent President Erdogan and the People’s Alliance of AKP and the Nationalist Movement party (MHP). This implies that markets remain uncomfortable with the constitutional changes and uncertainty about the future economic policy direction. Moreover, the election outcome suggests a decline in AKP support compared to previous general elections that may increase concerns in the party about the upcoming local elections in March 2019. With the lira plunge, higher energy prices and unsupportive base effects still in play, we expect inflation to rise further to above 14% this summer and while we expect some moderation after that, upside risks, remain in the near-term. The current account deficit in April reached its highest level since mid-2013 on a 12-month rolling basis, driven by rising core imports and higher gold and energy prices. The loss in growth momentum and a weaker lira will likely see the trade balance recover. The capital flows outlook, however, has weakened, leaving little room for policy complacency. A step-up in fiscal stimulus in 2018 has added to concerns about the inflation outlook and on public debt, at under 30% one of the strengths of the Turkish economy. Meanwhile, the external environment has turned less favourable, given rising core rates in combination with concerns about trade wars and global growth that have strengthened the dollar. In addition to recent data (including PMI at the lowest level since the global crisis, the decline in confidence indicators, the softening industrial production) which point at some slow down already in the second quarter, lira depreciation and reduced credit demand on higher borrowing costs will accelerate the rebalancing in the remainder of 2018. In fiscal policy, a rationalisation of public spending and adherence to fiscal discipline would be strong positive signals. Furthermore, a one-off round of restructuring of private and public sector debt to the state would help the fiscal balance. Transparency on the likely burden of contingent liabilities would be a step in the right direction, given the rise in the cumulative size of public-private partnerships that exceeded US$60bn at end-2017 (or 7.1% of GDP). In monetary policy, the government should address concerns on central bank independence that arose on political pressure for lower interest rates. Strengthening CBT independence with a sole focus on inflation and financial stability would be key for investors. Adverse spillovers from excessive TRY weakness on corporate balance sheets should be addressed quickly, given the short FX position of the non-financial sector. While steps to mitigate FX risks of SMEs have been taken (accounting for 20-25% of the corporate sector’s open position), further regulations to reduce large corporates’ currency risk should contribute to financial stability. In the banking sector, short-term refinancing risk remains high at US$78.3bn in April 2018. Despite sufficient FX liquid resources to cover obligations, with the inclusion of banking sector holdings at the CBT (US$30bn under the framework of the reserve option mechanism) and an improving long-term debt rollover ratio in recent months (above >100% on a 12-month rolling basis as of April 2018), external funding of banks will remain under close scrutiny. That and a deterioration in corporate sector balance sheets can trigger a deleveraging cycle with weakening. Overall, macro and financial actions by the new government addressing short-term vulnerabilities will be key for macro performance in the period ahead, while a reviving reform agenda in social, economic and political areas will also be crucial in taking Turkey to a recovery path. On 5 July, the Supreme Election Council (YSK) will release the final official results. On 8 July, the new parliament will hold its inaugural session and swear in President Erdogan and lawmakers. According to a spokesman, Erdogan will name the new cabinet immediately upon oath, with all eyes on the new economic management team. Concerns around unorthodox economic policy will persist given Erdogan’s statements in May that he intends to tighten his grip on economic and monetary policy. Given the weak results of the AKP in the parliamentary vote, there are also risks with regard to populist policies ahead of the March 2019 local elections. That said, Turkey's central bank's recent measures point to the institution’s ability to safeguard price stability, even if the back-loaded hikes and policy simplification didn’t fully reassure markets of the CBT’s independence. We also take comfort from comments by Deputy Prime Minister Simsek and Finance Minister Agbal ahead of the elections, pointing to a tightening in fiscal policy going forward. Moreover, Cemil Ertem, chief economic adviser to Erdogan, this week called the central bank’s independence “fundamental” and said that “strong steps in budget discipline” will be taken. A re-appointment of Simsek and Agbal to the economic management team would provide additional comfort to markets. Outside of economic policy, we expect the government not to renew the state of emergency in July in line with comments from President Erdogan before the elections. Concerns will, however, linger with regard to the risk of further investigations by US authorities in the Iran sanction evasion case that could go beyond individuals to also include banks or government institutions. The recent reimplementation of US sanctions vs Iran and Turkey’s purchase of Russian produced S-400 missile systems might further exacerbate bilateral ties.